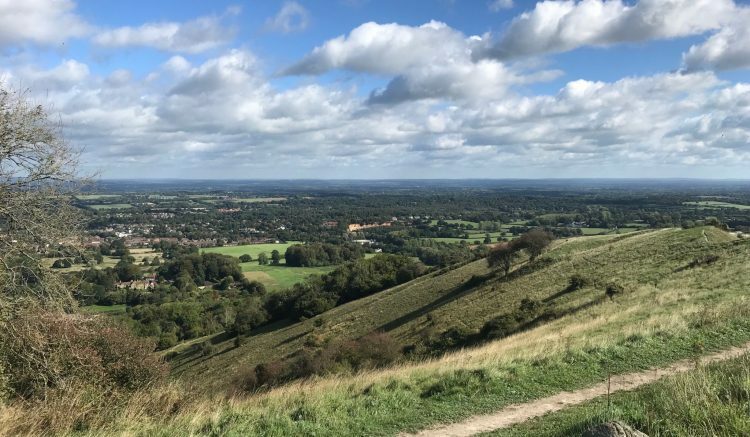 As forecast there was rain and high winds during the night and it looks like I will be in for a blustery day up on the Downs. 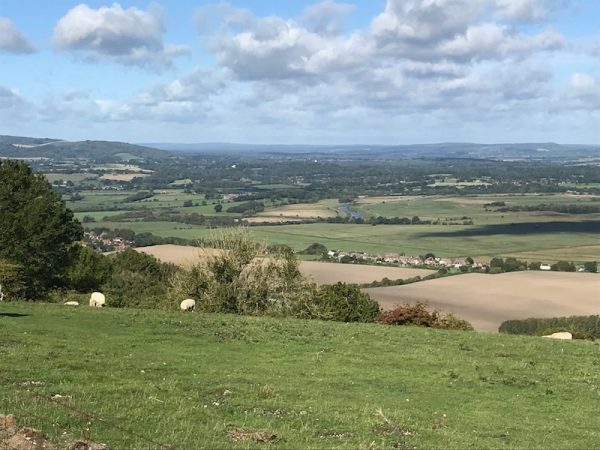 After an excellent cooked breakfast served in the dining area of the Sportsman, with its fine views over the Arun valley flood plain, I am loaded up with calories and ready to embark on another day’s walking. 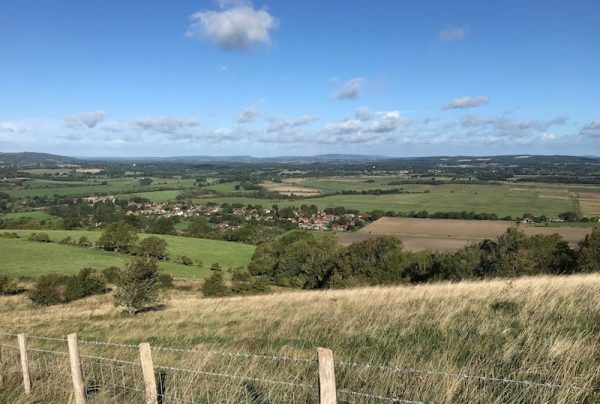 The sun is shining as I wander through Amberley, stopping at the village shop to buy my lunch, before crossing the busy B2139 and carrying on up Mill Lane to reach the point where I had turned off the South Downs Way (SDW) yesterday afternoon. Heading up hill I stop to look at the view behind me. The route climbs steadily as it continues on a broad track. 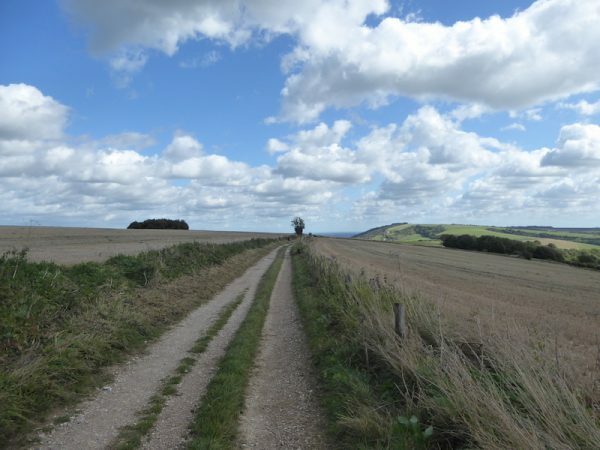 In 2014 Lynnie and I did a circular walk from Amberley and headed along this section of the SDW. On that day the chalk track was wet and slippery and hard going. Now, after such a prolonged dry spell it is firm underground, but a good uphill pull to start the day. 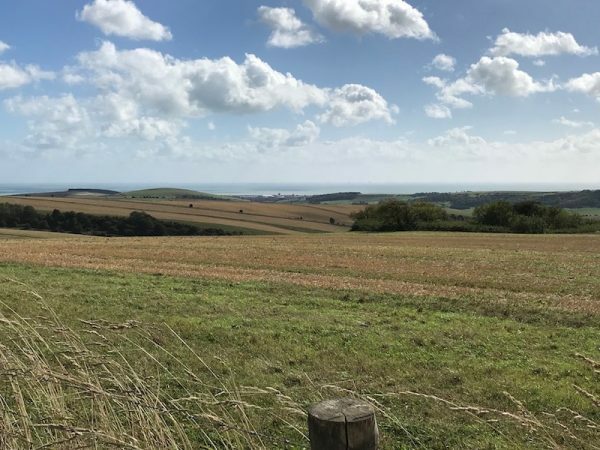 As I head along the ridge I enjoy fine views back across the Arun valley and although I have walked over two miles I can see down below me the Sportsman Inn where I stayed last night. 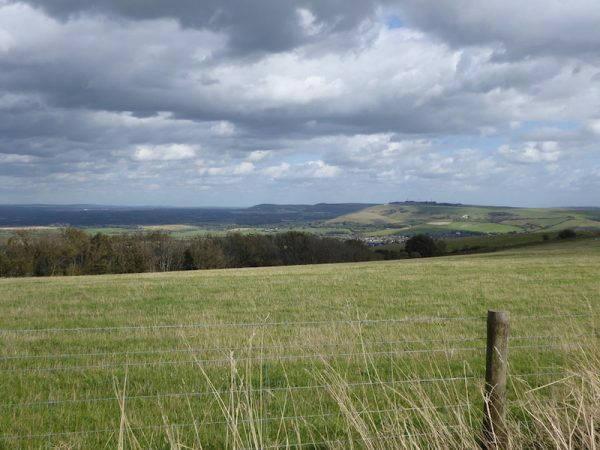 Soon I reach the Rackham Hill trig point which is just off the SDW. 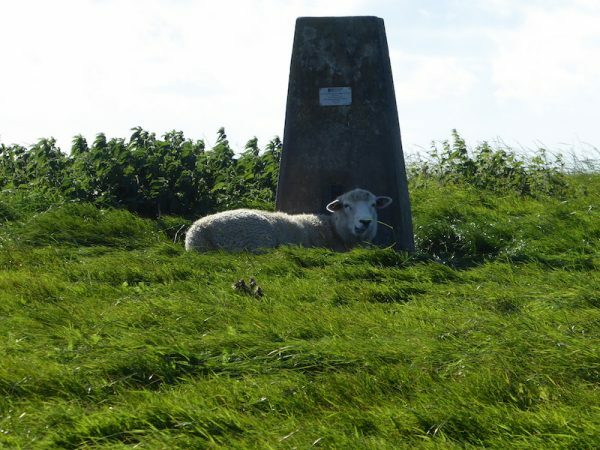 I have previously bagged this trig; today it is being guarded by a sheep. 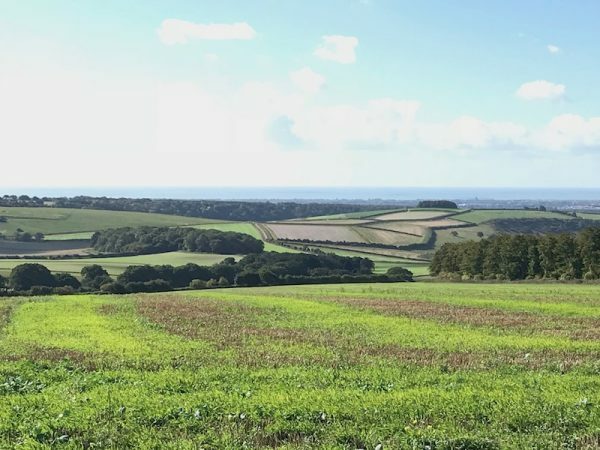 The visibility today is the best I have encountered so far this week and I can clearly see out to sea as I head over Springhead Hill. After passing a car park on my left I take a slight diversion away from the SDW. Instead of following the national trail route I take a path that forks away from it to the left. 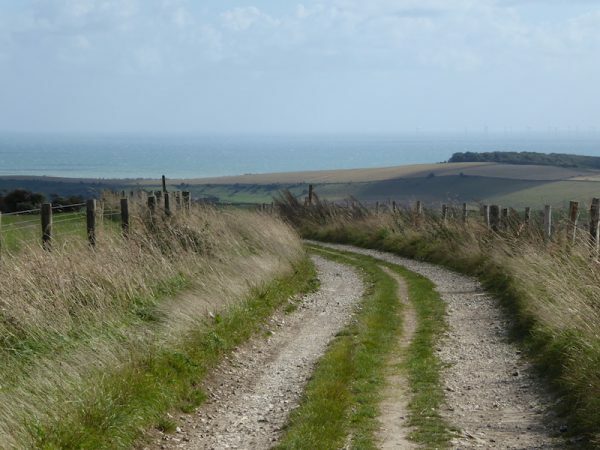 This path leads me towards Kithurst Hill where I notch up my 106thtrig point. 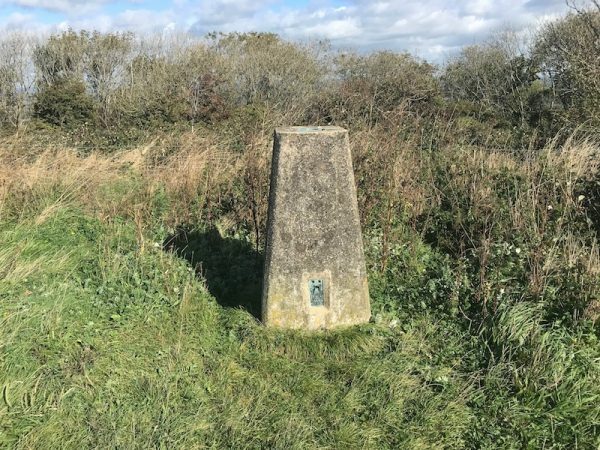 Soon after passing the trig point I take a footpath on the right leading back to the SDW where I turn left soon reaching the car park at Chantry Post. I now take a diversion away from the SDW to follow the footpath towards Blackpatch Hill. 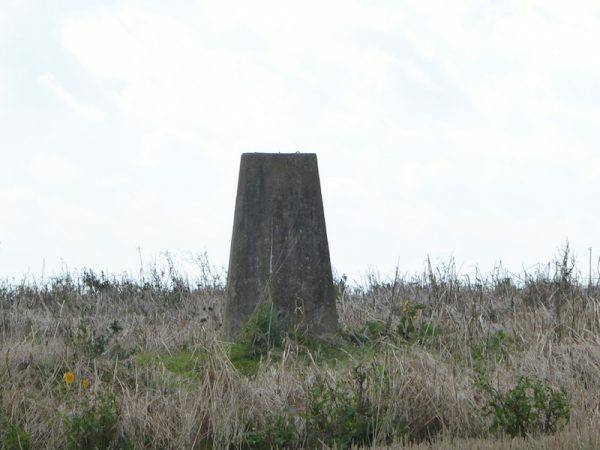 It is my intention to bag the trig point there. After a mile I approach the point where I should head up to the hill but I encounter a herd of cattle who do not appear welcoming. 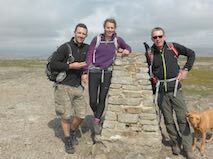 Though keen to bag the trig I am not going to put myself at risk so turn around and retrace my steps back to the SDW. Back on the main trail I make good progress, there is a stiff breeze as I continue along the track but the sun keeps popping out from behind clouds. In terms of navigation this is an easy trail to follow. I now head down to cross the busy A24. 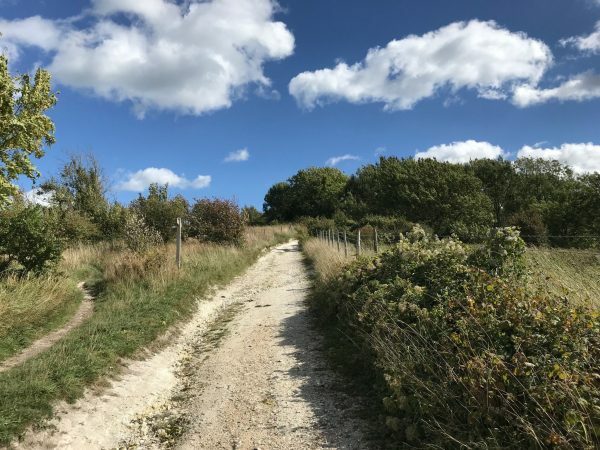 It takes a while until there is a suitable gap in the traffic, but once across I am heading up a chalk track again and the sound of traffic is soon a distant rumble. 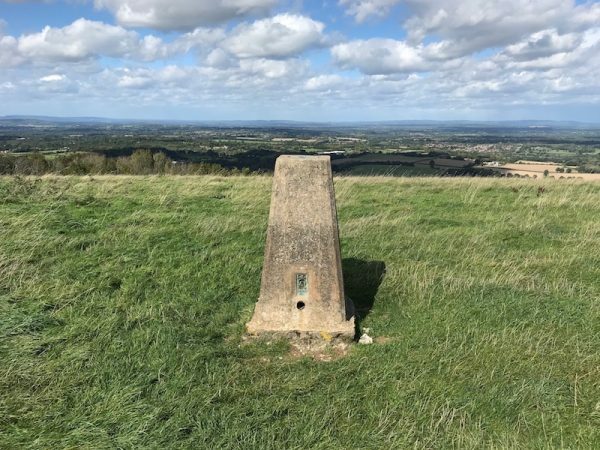 By the time I have reached the top of the hill and wandered across to the trig at Chanctonbury Hill the wind has picked up and it is blowing a gale. 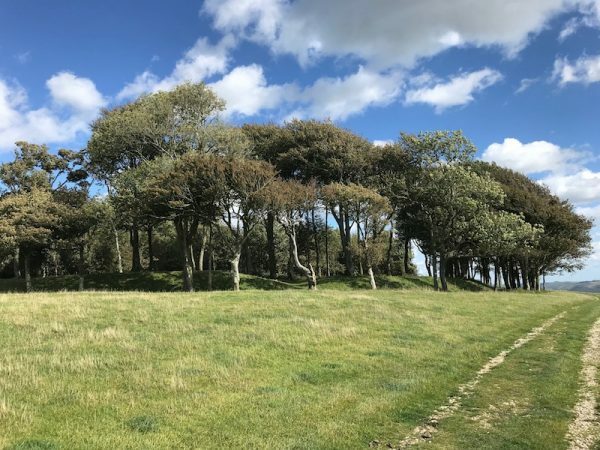 There are stunning views from this, my 107thtrig, but even with a few layers on it is suddenly a bit chilly so I continue on towards the hill fort on Chanctonbury Hill. Going over the hill I meet a couple coming up from the other side heading into the wind, they are being constantly buffeted and making slow progress. Soon I am out of the wind and in the absence of a bench, of which there has been a serious lack on this trail, I sit out of the wind on a grass bank and have my lunch. Refreshed I continue on my way, soon passing the trig point, my number 108, on Steyning Round Hill. 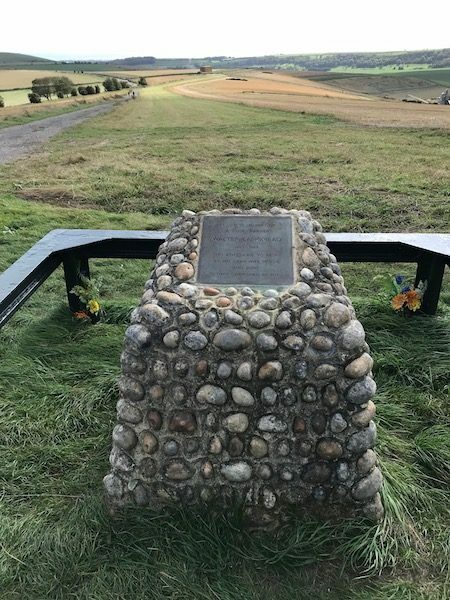 Then I reach the memorial to a local farmer Walter Langmead (1905 – 1989) and his wife Thelma (1909-1996). A fine spot to have your ashes scattered. The route continues on to reach a minor road and then turns right to follow a path beside the road. There are fine inland views from here and I can see in the distance the route I will be following tomorrow. Turning the corner I see the sea straight in front of me. This is the clearest view I have had of the water since starting the trail. Heading off Annington Hill, with the stunning Winding Bottom below me, I catch up a fellow walker. 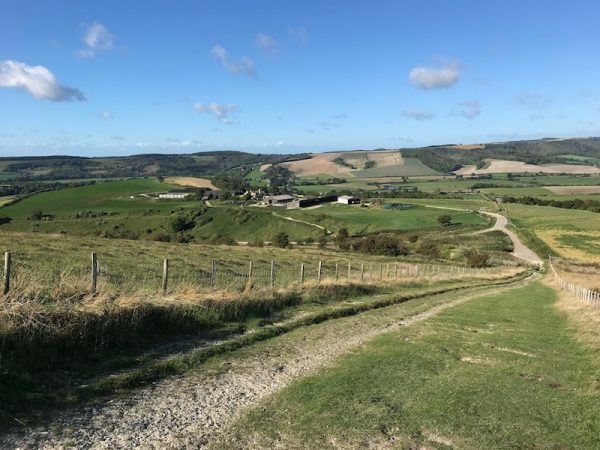 We walk downhill together discussing our walking; my companion is doing the walk in stages and is ending tonight in nearby Upper Beeding where his wife is waiting for him. 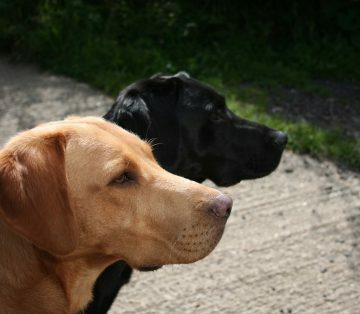 As we chat we discover we have a common liking for real ale and each know pubs the other frequents. So we spend half an hour strolling along discussing beer. It is nearing the end of the day, so walking along chatting about the finer points of various ales starts the thirst buds going. 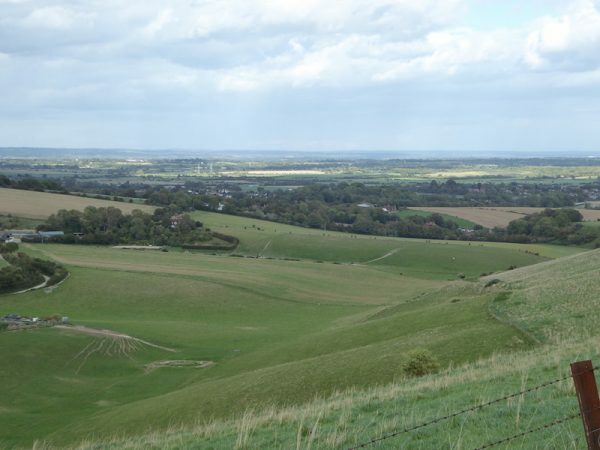 Our ways part after going through Botolphs where I take a left on the Downs Link path to head into Bramber. As I end the day’s walking it starts to drizzle, the forecast had been for showers and high winds, but fortunately I have covered 17 miles without getting wet. My accommodation in Bramber is the Castle Hotel after booking the accommodation I had read mixed reviews about this establishment. But my room is perfectly clean and adequate for my requirements. After a refreshing shower I adjourn to the bar for a pie and a couple of pints accompanied by an engaging conversation with a couple at the adjoining table.